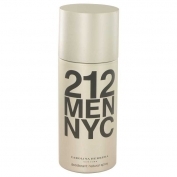 212 Men by Carolina Herrera is a Woody Floral Musk fragrance for men. 212 Men was launched in 1999. 212 Men was created by Alberto Morillas, Rosendo Mateu and Ann Gottlieb. Top notes are spices, petitgrain, lavender, green notes, grapefruit and bergamot; middle notes are ginger, , gardenia, violet and sage; base notes are labdanum, sandalwood, musk, guaiac wood, vetiver and incense.